As a frequent traveler to Disney parks and the Disney Cruise Line, I’m a huge fan of Disney gift cards. They reduce my need for cash on hand, allow me to sock away money for trips, and make great gifts for people who will be in the parks. As this type of card becomes more and more ubiquitous, you may think you know all there is to know about Disney gift cards. But maybe not. Read on. Where Can I Purchase a Disney Gift Card? As part of the day to day business of TouringPlans, I purchase a lot of gift cards for people who are doing dining research. Those are cards I buy from DisneyStore.com and ship directly to the recipient. Shipping is free unless you expedite it and the card usually arrives in the mail in about a week. They also have a large selection of designs to choose from. 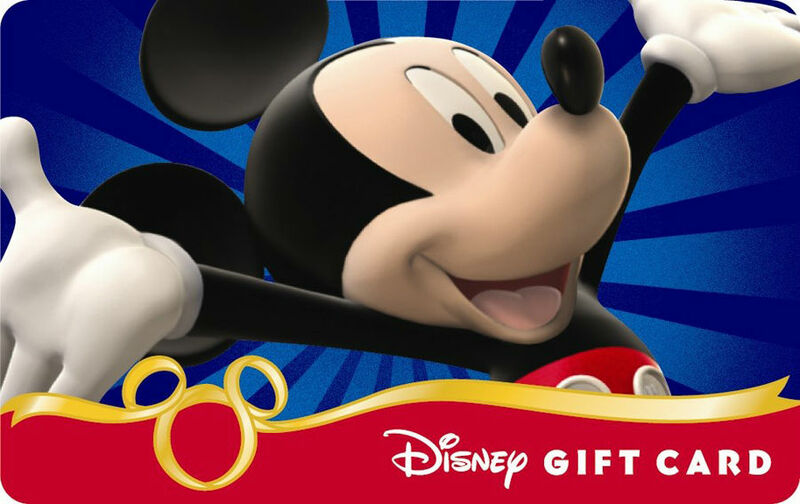 Note that DisneyStore.com sells two types of gift cards – the plastic kind you can use in the parks that we’re talking about here, and the online gift card that can only be used at DisneyStore.com. Disney also has a dedicated site, DisneyGiftCard.com, which has the biggest selection of designs and even showcases cards that are no longer available (apparently old gift card designs are collectible). This site had some issues for me as described in the section on checking your balance. When I’m in the parks and have a need for cashless purchasing, I buy a gift card at any merchandise location. This approach also works great when you want to let your kids be able to make purchases, but don’t want to hand over cash or give them charging privileges. You can also buy gift cards in pre-determined amounts (usually $25 or $50) in big box stores like Target or Walmart. Rarely, warehouse stores like Costco or Sam’s will also sell packs Disney gift cards at a small discount. Finally, if you’re near a Disney Store, you can also buy Disney gift cards there, but be sure you’re buying the ones that can be used in the parks. Where Can I Use a Disney Gift Card? If you’re in a United States park or sailing DCL, pretty much anywhere that can take a credit card (that is any place with a card reader) – a very few kiosks are cash-only. Disney gift cards are not accepted in any of the international parks such as Disneyland Paris, Tokyo Disneyland, or Hong Kong Disneyland. What Can I Buy with a Disney Gift Card? What CAN’T I Buy with a Disney Gift Card? One favorite of many readers for getting a deal on purchasing a Disney gift card is to use a Target REDcard to buy the gift card at the Target checkout. Because the Disney gift card is considered an “entertainment card” at Target’s POS, it is eligible for a 5% discount when purchased with a REDcard (debit or credit). Because I don’t like to have store credit cards, I use my Disney Visa from Chase (which we use for all our Disney expenses). We get 2% back on all Disney purchases when we use this card. I put the cash back on a Disney Rewards Card (explained below). The Disney Visa does have a yearly fee, but for TouringPlans, we charge enough that the 2% back is a good deal for us. If I did not have a Disney Visa, I would use my no-annual-fee credit card that gives 1% cash back into my bank account. Another tactic I haven’t tried, but would love to hear about it you have, is online gift card exchanges. These are sites online where you can trade the gift card you got for, say, Williams-Sonoma when your mom knows the tool reached for most often in your kitchen is a takeout menu for a card you would use, like Disney, where you will buy your weight in Dole Whips. Or you can just buy others’ cards at a discount. I checked a few sites to see if they were selling any Disney gift cards at a discount and didn’t see any right now. Guy and Morgan still have money on their cards! How Can I Check the Balance on My Disney Gift Card? Most often, you will just see the balance remaining on your receipt after you make a purchase with the gift card. Cashiers at shops inside Walt Disney World and Disneyland Resorts can also check your balance for you without ringing up a sale. Disney claims you can check your balance at DisneyGiftCard.com, but every time I tried while writing this, the site encountered a database error. For a more analog experience, you can call 1-877-650-4327 to get your balance (obviously you’ll need the card in hand for this). 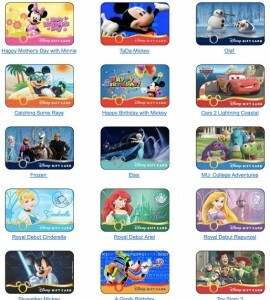 And for checking on the go, you can install the Disney Gift Card app (IOS only). 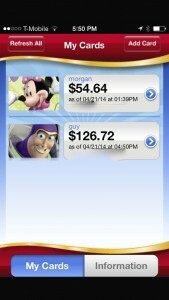 This app lets you track the balances of multiple Disney cards on your iPhone (though it can’t take the place of a physical card, nor can you use it to reload a card). How Can I Reload My Disney Gift Card? Unfortunately, reloading your Disney gift card is not as easy as reloading other gift cards. You have two choices – do it in person at a Disney location that sells cards or do it over the phone. To reload your card over the phone, call 1-800-362-4533 option 5 then option 2 (this is not the customer service phone number on the back of the card – it’s actually Disneyland Resort Merchandise Services a.k.a. DelivEARS). While you can load more than one card per call, there is a $50/day limit on how much you can add at a time. However, when I wanted to add $200 to one of our researcher’s cards, Disney did say they could do it in four transactions over the span of four days. It’s a little clumsy, but it does the trick. They will also load more than one card per call. How should I protect my card? Like a ticket, you should take a photo of the back of the card, so you’ll have the number in case it’s lost or stolen. How much money can I put on a Disney gift card? When you purchase through DisneyStore.com or DisneyGiftCard.com, you can buy $25, $50, $75, $100, $125, $150, $200, $300, or $500 cards. You can reload up to $1000. Cards not purchased through Disney (like at Target) are in set denominations usually of $25 or $50. When you purchase gift cards at a POS station like a resort merchandise shop, you can choose any amount you wish. I’ve been stockpiling Disney gift cards for my upcoming vacation – isn’t my travel agent going to get mad when I pay in denominations of $25 and $50? We asked our travel agent friends, and they said this happens all the time, so don’t sweat it. I’ve paid for my trip with a bunch of Disney gift cards, now what? Hold onto them! If you need to cancel your reservation for any reason, Disney will put the money back onto the cards. What is a Disney Rewards Card and how is it different from a Disney Gift Card? A Disney Rewards Card is connected to the Disney Visa from Chase. It functions like a gift card. Each month you earn rewards based on how much you spend and have the option of either moving the money to your Rewards Card or putting it toward a statement credit for Disney- and travel-related purchased you’ve already made. If your Rewards card has money on it, you can use it pretty much anywhere you can use a Disney gift card. Does a Disney Gift Card Expire or Have Monthly Fees if I Don’t Use It? Where can I find more answers about Disney gift cards? There is an FAQ on DisneyGiftCard.com. Do you use Disney gift cards to help save for your trips or to make things easier for you in the parks? Did we miss any tips? Talk about it in the comments. It might be worth mentioning that they can be used at Downtown Disney as well. It wasn’t obvious to me before our last trip (2011) but we were able to use them at the Lego store with no problems. I’m assuming this still holds true? This isn’t quite the same, but while staying at a Disney Hotel, I was able to charge my LEGO Store purchase to my room, and I could pay off my room balance with Disney gift cards. Our Kroger had 4x fuel points last month. I bought $2500 in Disney gift cards to pay off our vacation balance and ended up with 10,000 fuel points or about enough for $1 off per gallon on 10 fill ups. The cards saved me $100 in gas just in the trip balance alone. Please note for international travelers. Cards bought outside the US cannot be used in the parks. ** I’m from Canada – can I buy US dollar Disney Cards at my local Canadian Disney store? Would these be use-able on DCL? **How could I purchase Disney Gift cards if I don’t have a credit card? Similar to what Becky mentioning about Kroger, here in Ohio Giant Eagle offers occasional double Fuel Perks on gift cards. This double Fuel Perks means that for every $50 spent you get 20 cents of your next tank of gas. My wife and I took advantage of this before our last trip purchasing a $500 gift card which meant that the next time we filled up we saved $2 per gallon! We like to look at it as saving ~$25 on our gift card. We have been able to buy disney gift cards at BJs- they tropically are $25, $50, $100 or a 3-pack of $50 sold at a discount. We purchased a $100 card for $95.99 and I believe we were able to earn our 2% rewards on our BJs membership. 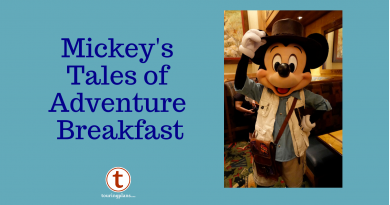 Plus- we still earn our Disney rewards on our Disney Visa card! We also have been asking for disney gift cards as presents for all occasions throughout the year for ourselves and our kids. So far our children have all of their spending money and we are using ours towards extras like the photo pass and very Merry Christmas party tickets! I love hearing about everyone’s gift card deals. Keep the stories coming. BJs sells Disney gift cards all the time. The $100 card is $95.99. BJs Rewards don’t apply to gift cards, but I think I get 2% back in BJs bucks on my BJs Visa. I love Disney gift cards, I HATE the Disneygiftcard.com site!! i have never been able to check my balance on it!! When we came back from Spring Break I tried on 4 different computers using 2 different OS and still got their annoying error message. One thing to note, the Disney Rewards Points you get from the Disney Visa DO expire, and the rewards card you receive once you convert your points into money will also expire within 18-24 months. I use Disney gift cards from Target for everything. I did run into a problem at the Disney Store near us. They wouldn’t let me use the gift cards to purchase Disney World Tickets. They said there was a difference between a gift card purchased a Target versus a gift card purchased from Disney? Sharon, I would have asked to speak with a manager. There should be no difference. In fact, it says on the back that can be used at Disney store locations. Can you use multiple gifts cards to buy tickets now? I tried to do it in the past over the phone and they could only take one payment. Nope, not for tickets by themselves. We were able to get around this by turning them into a vacation package though. See my post below. Gotcha! Unfortunately we mostly stay on our DVC points and usually get annual passes. I will definitely keep this in mind if we book cash visits though. Can we use the gift cards to pay for the tips in the table service restaurants? Giftcards.com sometimes has Disney gift card which they sell at a discount. I recently bought a $150 card for $139.50 (or 7% discount). For those staying at a Disney resort, just tack on tickets and turn your reservation into a vacation package. This allows you to pay off your whole package with as many Disney gift cards as you want online (minimum $20 increments). Plus you get a ton of perks for the package. We had originally planned on staying at a resort and then going to Undercover Tourist for our tickets, but realized that the discounts and perks saved from adding our tickets to our reservation was way better. Perhaps if you could buy in larger amounts it won’t be so bad, but pretty much everywhere else Disney only allows you to use one gift card per transaction, which poses a problem if you get $50 cards from Target. Oh, and yes, the gift card exchange websites do sell Disney. Unfortunately, they just get taken super fast. I pretty much have to constantly stalk the websites for them. Once during a New Year’s special (additional 3% off all gift cards) they had restocked over $1500 in Disney gift cards, but by the time I was even able to check out, they were all sold out! I like to order personalized gift cards from the Disney Store online. We upload our own photos, so the kids have cards with their own picture from previous trips on them. It is a souvenir, as well as an easy way to know which card belongs to which child. My MIL bought me a personalized one for the trip we took this year. It was really cute, and very nicely packaged. I thought it was a really good gift option.